It’s been more than thirty years since Knoxville hosted the World’s Fair, and there’s only been one such expo in the United States since (New Orleans in 1984). Yet after its fifteen minutes of international fame, “Knoxpatch” settled back into its easygoing, unpretentious ways. You won’t find Tennessee’s third-largest city hosting a prime-time drama like ABC’s Nashville or launching an aggressive advertising campaign like upstart Chattanooga. Since 1982, K-town has been quietly turning its downtown warehouses into hipster bars and boutiques, repurposing its historic buildings, and cultivating its Appalachian roots. It was local before local was cool, and the national media, from the New York Times to Garden & Gun, have taken notice. 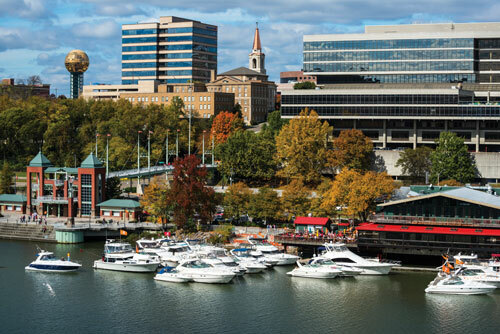 At its core, Knoxville is a university town, embracing the catchphrase “Austin without the hype” that originated with a San Francisco music critic. Just ask the 100,000 people (more than half of the city’s population) who drive—or boat—to Neyland Stadium when the University of Tennessee Volunteers take to the gridiron. The hallmarks of collegiate culture—youthfulness, irony, experimentation, indie everything—color Knoxville’s food, music, nightlife, and ambience. The best place to savor the city’s vibrant spirit is downtown, so we checked into the Oliver Hotel, a twenty-eight-room inn located in a brick building with large arched windows originally built for the Peter Kern Bakery in 1876. Velvet chairs and tall upholstered headboards glam up its tight spaces, while handcrafted tables and prints by the beloved but recently defunct letterpress shop Yee-Haw Industries provide artsy warmth. From the hotel, we could walk over to Market Square, a promenade and outdoor concert venue flanked by boutiques, coffee shops, wine bars, and restaurants—with nary a Starbucks in sight. The plaza has served continuously as an open-air marketplace since farmers gathered here in the mid-nineteenth century, and it still hosts weekly farmers markets as well as art walks, concerts, and the famous annual International Biscuit Festival in May. Exploring the area, we discovered finds like regional artisan wares at Rala, cute clothing and accessories at Bliss, and barrels of vintage-style candy at Mast General Store. As the Lady Vols are an integral part of the city’s fabric, we visited the Women’s Basketball Hall of Fame, where we saw amusing artifacts like an eight-door Pontiac station wagon used to transport Moore’s All American Red Heads, a midcentury women’s pro team. Admission to the hall is only $7.95, and, as we soon found out, some of the best things in Knoxville are free. The WDVX Blue Plate Special, for example, is a gratis noontime concert held daily in the Knoxville Visitors Center. We saw the Knox County Jug Stompers, a young bluegrass group on banjo, harmonica, guitar, drums, and washtub bass (played by a barefoot April Hamilton). Another no-budget activity is riding the elevator up the Sunsphere, a gold disco-ball tower left over from the World’s Fair. We borrowed complimentary bikes from the Oliver and cycled there via the Greenway, a system of paved trails along the Tennessee River. I appreciated the calories burned on said trails, given the temptations of Knoxville’s culinary scene. A pesto and sun-dried tomato pizza with an impossibly thick yet crisp crust proved that resident favorite the Tomato Head lives up to the hype, and we had our fill of fancied-up Southern dishes like spring succotash gnocchi with crème fraîche and cast-iron seared steak with Benton’s bacon at newcomer Knox Mason. Nightlife options also abound downtown. The Bijou, the oldest purpose-built theater in the state, and the iconic Tennessee Theatre, a 1928 movie palace boasting an interior that rivals the Fox, are here, as are many cozy bars and nightclubs. We sipped specialty martinis at Sapphire (a modern gem housed in a former jewelry store), savored housemade beer cheese dip and locavore pub grub at the Public House, north of downtown, and eventually ended up back in the Oliver’s Peter Kern Library, a speakeasy hidden behind a nondescript door (though easily recognizable by the chatter of conversation and clinking of ice cubes). It makes sense that a city of academics would have a literary-themed bar—with a cocktail menu masquerading as a World Book encyclopedia and drinks named the Grendel and Mr. Darcy.